I admit it. I was a writer for the Halifax Daily News, back in the halcyon days when the capital of Nova Scotia was a lively two-newspaper town. While the Chronicle Herald was very much the “establishment” paper (and remains so today), the Daily News was the upstart, cheeky, rabble-rousing new kid on the block – the paper that was willing to upset the apple cart with more vivid opinions and harder-edged reporting, along with some columnists who could really get up people’s noses, yours truly foremost among them. It was a wonderful place to work. Alas, a series of ownership changes, which preceded the general decline of the newspaper industry, introduced great instability. A series of cuts in 2005 prefigured the abrupt closure of the paper in February, 2008. Reborn as the much-lessened Metro, the existing tabloid is but a ghostly reminder of Halifax’s salad days as a two-newspaper town. Many of the people I had the pleasure of working with at the Daily News went on to greater things, and higher salaries. Editor Bill Turpin ended up with the Provincial Government. Entertainment editor Marilyn Smulders moved from Dalhousie to NSCAD where she now expertly guides their communications. Arts writer Marla Cranston is the the public relations person for the Nova Scotia Barrister’s Society. Arts Editor and columnist David Swick teaches ethics at the King’s College journalism school. Lifestyle writer Skana Gee handled the publicity for the long running HBO series Haven. I produce feature films. The list goes on. 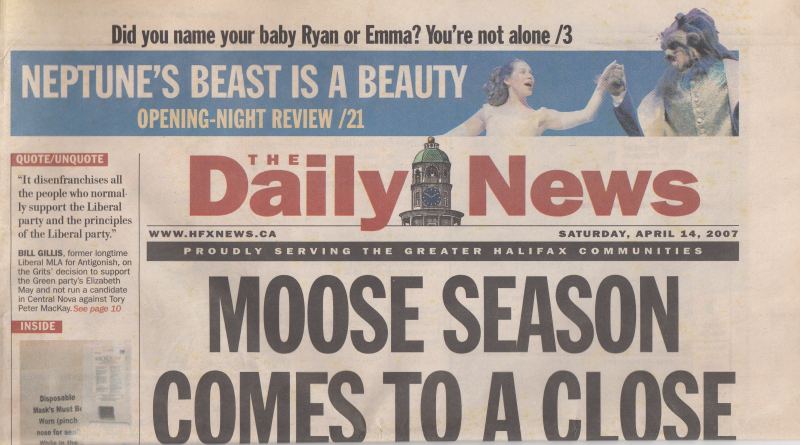 The Daily News made Halifax a better place. It also made the Chronicle Herald a better paper. Watching the Herald’s current bitter labour dispute linger reminds us all how fragile the mainstream media has become in an age when the internet was allegedly going to make media available to everyone. The lack of arts and culture writing and coverage these days in Halifax is especially startling, and more than a bit depressing. Finding decent theatre reviews or anything more than puff pieces when it comes to music is virtually impossible. And while the media scene is constantly changing, there has been nothing to compare with the coverage Halifax received from the Daily News and the Chronicle Herald in those heady days of the 1990s.